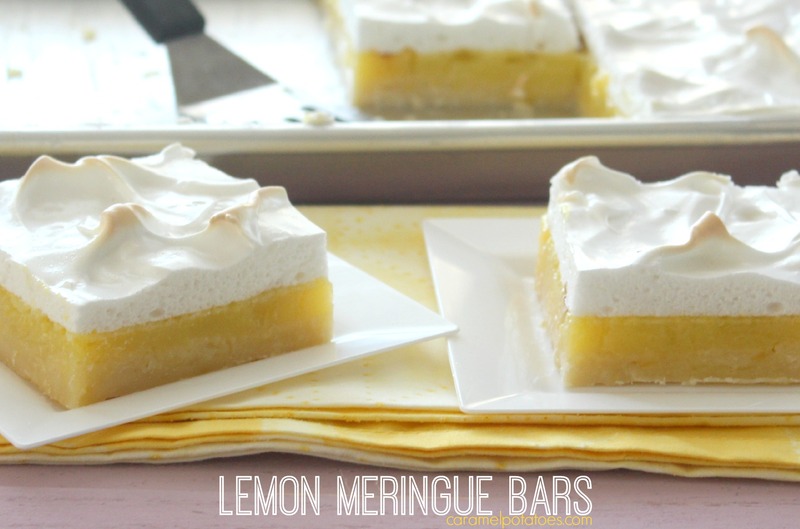 I love these bars – all the great zesty lemon taste of meringue pie in an easy-to-make and easy-to-serve bar. You may even like these bars better than the pie – the sweet flaky crust on these is amazing! What are you waiting for?? Get you lemon on! Got a craving for more luscious lemon? Try our Lemon Souffle Pancakes, Strawberry Lemonade Poke Cake, Lemon Zucchini Loaf. 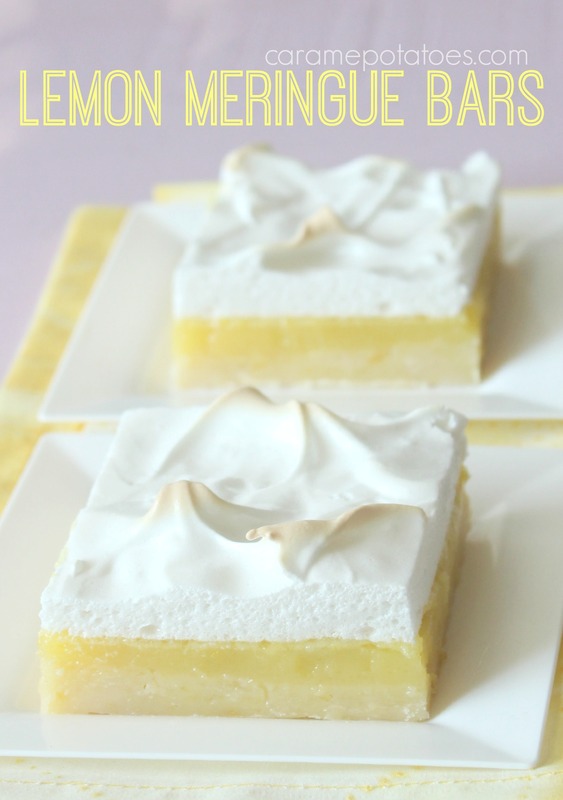 Lemon Sheet Cake, Lemon Muddy Buddies, Lemon Curd, or Lemon Sauce. That’s a lot of fresh lemon flavor! Transfer mixture to a 9-by-13-inch rimmed baking sheet. Press batter evenly into baking sheet. Chill in freezer 10 minutes. Bake until golden, 20 to 22 minutes. Keep the oven at 350 and let the crust cool on a wire rack while you make the filling. Whisk together the 6 whole eggs, 1 3/4 cups plus 2 tablespoons granulated sugar, the lemon juice, and 1 tablespoon plus 2 teaspoons lemon zest. Pour over crust. Bake until filling is set, 18 to 20 minutes. Keep the oven at 350 and let cool while you make the meringue topping. Put egg whites and 1/2 cup granulated sugar in the clean bowl of an electric mixer fitted with the whisk attachment. Beat on medium-high speed until stiff peaks form. 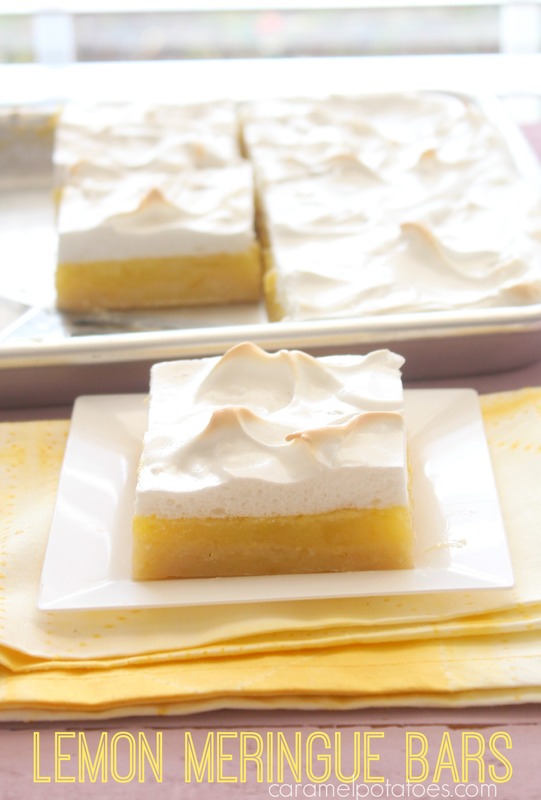 Using an offset spatula or the back of a spoon, spread meringue over filling, swirling to create soft peaks. Bake until meringue begins to brown, 8 to 10 minutes. Let cool completely. Cut into bars. OMG. These look amazing. 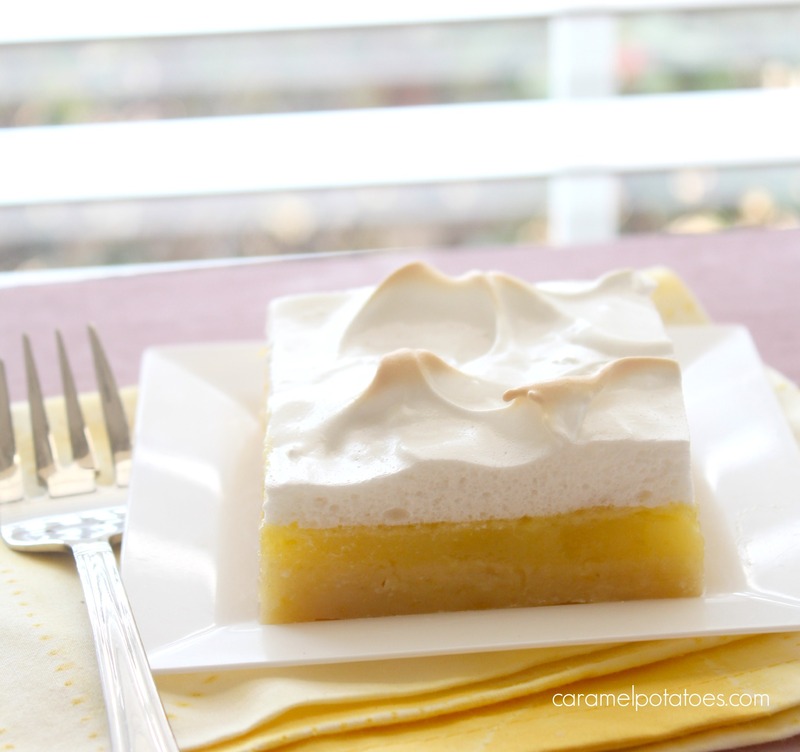 I love lemon meringue pie. I will be making these soon. I just couldn’t wait to make these. 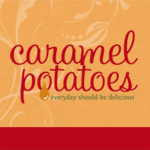 We love, love them- probably too much! Thanks. Have a great weekend.